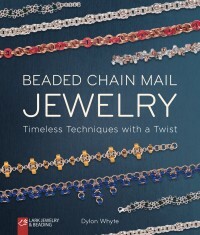 Chain mail is one of the hottest jewelry trends out there. Bestselling author and chain mail expert Dylon Whyte presents his time-tested, time-saving techniques plus 26 breathtaking projects, ranging from extremely simple to challenging. The exciting collection includes a delicate Persian patterned anklet, embellished with tiny silver bells; an amethyst opera-length necklace; and silver earrings shaped like inverted peacock feathers.